Delas Freres is one of the top producers of Rhone wine in a myriad of appellations. Delas Freres makes outstanding wine from Cote Rotie and Hermitage in the Northern Rhone. The company also produces one of the top value wines from the region with their Cote du Rhone. Delas Freres has one of the longest histories in the appellation. The company was formed in 1835 when Philippe Delas and Charles Audibert agreed to purchase Maisons Junique. The new company changed their name to Audibert and Delas. Philippe Delas had two sons, Henri and Florentin Delas. Florentin Delas eventually married the daughter of his fathers partner, Charles Audibert. In 1924, the two brothers took over management of the company and altered the name of the company to what is still in use today, Delas Freres. When the next generation took over management of Delas Freres in 1960, the company had become one of the top producers of Rhone wines with holdings in Cote Rotie, Hermitage, Cornas and Condrieu in the north as well as in the south in the Chateauneuf du Pape appellation. In 1977 the company merged with the well known Champagne firm, Deutz. In 1993, Delas Freres was in turn taken over by another Champagne producer, Louis Roederer in 1993. Delas Freres produces a myriad of wines from various Northern Rhone appellations including: Hermitage, Crozes Hermitage, St. Joseph, Cornas, St. Peray and Condrieu. In 2016, Delas Freres hired the highly, respected, Architect, Carl Fredrik Svenstedt to design the most modern facility in the Rhone Valley. The winery will be located in Tain Hermitage. The best vintages of Delas Cote Rotie are: 2018, 2017, 2016, 2015, 2012, 2010, 2009, 2007, 2005, 2003 and 1999. Delas Freres produces 2 wines in Cote Rotie. Delas Freres La Landonne made its debut with the 1997 vintage. The wine is made from 100% old vine Syrah, planted in the famous La Landonne vineyard. The grapes are all from purchased fruit that comes from vineyard with vines that are older than 50 years of age. The oldest vines for this wine are more than 70 years of age! The grapes are 100% destemmed. The grapes are cold macerated before fermentation, there are minimal rackings and the wine is aged on its its fine lees. 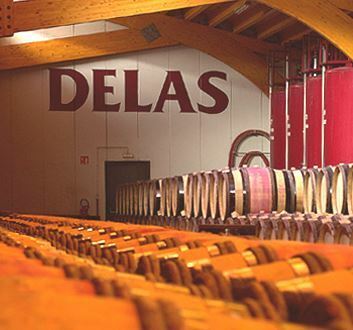 At Delas Freres, for the barrel aging, they stopped using large 40 hectoliter barrels and have since moved to small, 225 liter French oak barrels. Malolactic fermentation takes place in barrel. This wine is then aged in an average of 40% to 50% new, French oak barrels for close to 18 months before bottling. Delas Freres La Landonne is a small production wine, making it hard to find. On average, slightly more than 200 cases are produced every year, making it difficult to find after release. The wine is expensive, but it’s a beautiful, rich, powerful, perfumed, age worthy expression of Cote Rotie. Delas Freres Seigneur de Maugiron is their entry level wine. Seigneur de Maugiron is produced from a combination of grape sources. 40% of the fruit is sourced from land owned by Delas Freres while 60% the grapes comes from purchased fruit. Two thirds of the grapes are grown on the Cote Brune. The remainder of the harvest comes from the Cote Blonde. All together, the vines are planted in 7 different lieux-dits. Some the vines owned by Delas are old, as they planted in the 1950’s. 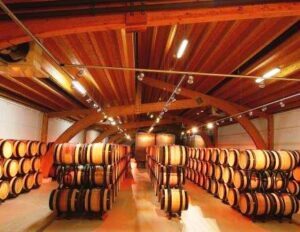 The wine is aged for between 16 to 18 months in an average of 15% new, French oak barrels before bottling. About 1,800 cases of Delas Freres Seigneur de Maugiron are produced each vintage. As of today, for Delas Freres in Cote Rotie, 2009 La Landonne is their best vintage yet. But in the years to come, 2010 might take the edge. Either way, it’s going to be a lot of fun comparing the two vintages over the next few decades! Delas Freres Cote Rotie, when young, should be decanted at least 1-3 hours, give or take, allowing the wines to soften and open their perfume. Older vintages might need very little decanting, just enough to remove the sediment. Delas Freres Cote Rotie is usually better with 5-12 years of cellaring and should be at its best between 10-20 years of age. Delas Freres Cote Rotie is best served at 15.5 degrees Celsius, 60 degrees Fahrenheit. The cool, almost cellar temperature gives the wine more freshness and lift. Delas Freres Cote Rotie is best served with all types of classic meat dishes, veal, pork, beef, lamb, duck, game, roast chicken, roasted, braised and grilled dishes. Delas Freres Cote Rotie is also good with Asian dishes, hearty fish courses like tuna, mushrooms and pasta. Condrieu, the white wine of Delas Freres is best served with a myriad of different seafood dishes, shellfish, crab, lobster, sushi, sashimi, chicken, pork and veal, as well as Asian cuisine. Spicy white peaches, flowers, apricot and spice create the nose. The wine is unctuous, round, fat and juicy, with sweetness to the fruits, length and purity, along with a gentle touch of honey in the finish. Lush, round and vibrant, with a white peach and floral perfume, the wine is ripe, rich, round and fresh. You can enjoy this now and over the next few years. Inky, full bodied, deep, long and intense, the wine is meaty, fresh, powerful, tannic, full bodied, long, fresh and rich. The fruit is ripe, and so are the soft, polished, yet persistent tannins. This should age for decades. Deep in color, the espresso, licorice, smoke and flint, paired with layers of juicy, ripe fresh, red fruits show up with ease. On the palate, the wine offers richness, density, purity of fruit, herbs, crushed stones and a wall of ripe, lushly textured, dark red berries. This will age quite nicely. Earth and herbs pop right away before reaching all that sweet, silky, fresh, red fruit. The tannins are soft, the wine has lift and energy, leaving with you a trail of olives and fresh cherries in the finish. Best Chateauneuf ever produced from Delas. This has volume, texture and depth of flavor, with all of its juicy, sweet, ripe, kirsch, underbrush, licorice and herbs. The lush, red fruit filled finish is a treat. Slightly honeyed yellow fruits, minerality, length and persistence are found here. Round in texture, the wine is rich and full, with fresh, pears and white fruits in the finish. Almost opaque in color, the first thing you notice is the minerality, with all those crushed rocks and stones. From there you quickly move to salty, red berries, smoke, herbs and spice. Full bodied and rich, the wine fills your mouth, coating your palate layers of ripe, deep, black fruits and freshness that builds in intensity. With the backbone to age, this is all about the intensity of flavor, purity of the fruit and the deep gravel that comes through on the nose and peppery, red berry palate. Give it 7-9 years and this will rock! Smoke, earth, truffle, and deep black fruits on the nose get you ready for the blast of ripe, rich fruits and salty tannins. This is a parcel selection from their vineyard that truly competes with many more expensive Hermitage wines. Deep in color, with a smoky, grilled meat and dark red fruit nose, the wine is lush, rich, round, ripe, full-bodied and generous with its fruits. Silky, polished, round and lush, with ripe, sweet, red fruits, tannins that add strength, structure and the ability to age. Give this 6-8 more years and you're going to be quite happy with this wine. Cracked black pepper galore is the first thing you find. From there you enjoy a blend of herbs, spices, truffle, crushed rocks and red fruits. In the mouth, the wine is vibrant, focused, fresh and clean, with a crisp, peppery, red berry finish. Give it a few years before pulling cork to develop more secondary notes and softness. Garrigue, pepper and wild cherries here open the nose. On the palate, the wine offers sweet, lushly textured fruit, soft tannins and a bright, crisp, fruity, kirsch and red berry finish. Loads of spicy, red fruits, kirsch, olives, flowers and garrigue. There is decent concentration and freshness in the kirsch finish. Deep in color, with a garrigue, black raspberry and spicy tone, the wine is medium bodied, forward, early drinking with black cherry, spice and herb finish. I'd drink this over the 1-3 years. Clearly this is uncomplicated, but for $10-$12, it's a solid value wine. Concentrated, richly textured and loaded with flowers, vanilla, nectarines, orange and yellow citrus notes, with just a drizzle of honey, the wine is buttery, juicy, fresh and clean. Still young, this is one of those Northern Rhone white wines that will better in a decade. The wine was made from 100% Marsanne. Unadorned, simple, but correct, the wine is on the short and sweet side. This just gets going and never quits. The wine is incredibly intense, perfectly balanced and the purity in the fruit coats your palate with layers of lush, powerful, ripe, mineral-driven, salty, deep, dark red fruits. The seamless finish stays with you for about 50 seconds. Wines this good can be enjoyed young, but the real fireworks should kick in between 2025 and 2030. It is going to be worth the wait. Powerful, long, concentrated and intense, the wine is full bodied, richly textured and packed with perfectly ripe, dark red fruits. There is a purity to the fruits that stands out, and is made even better by the appearance of spice box notes, truffles, wet earth, licorice and pepper. Lay this down for another 6-10 years and this will be a superb wine. Forward, expressive, charming and surprisingly voluptuous for an Hermitage this young, there is freshness, and a vibrancy to the sweet, spicy, peppery, dark red fruits, hints of licorice and smoke. Full bodied and already fun to drink, I'm sure this will age for at least a decade or longer with ease, but if you are sitting on more than a few bottles, feel free to pop a cork. Voluptuous, dense, full-bodied and deep, the wine is powerful and loaded with tannin to age for decades, but the tannins are so ripe and soft, the wine feels well defined. The dark red fruits taste, smell and feel great. What a knockout. with its intense levels of concentrated, powerful, ripe, dark red fruits that come at you in layers, you also find smoke, thyme, wet earth, licorice, black pepper, espresso and hints of flowers. Long and complex, wait another 4-5 years and things will be even better. Not mature, but definitely ready to go the fruit shows a beautiful cherry note, with loads of smoke, thyme, pepper and earth, full bodied, amazingly soft for a young Hermitage, give it an hour or two in the decanter before imbibing. Young, but with an hour or so of air, this seductive, supple, medium/full bodied wine is making it hard to resist its sweet, fresh, kirsch, pepper, black raspberry, spice, floral and earthy pleasure. Lots of freshness and soft textures in the fruit filled finish. Drink this while you are waiting for the La Landonne to come around. Medium/full bodied and very forward for this wine, the round, soft textured wine is filled with fresh black plums, cherries, licorice, earth and espresso. This is already fun to drink with 1-2 hours in the decanter. Still opaque in color, this intense wine opens with mineral, smoke, blackberry, boysenberry, earth and spice. This powerful, full bodied wine is packed with layers of ripe fruit and tannins that require at least 10 -15 more years to come around. Not much of this stunning Hermitage wine is made as the production hovers at close to 500 cases per year. Fortunately, for fans of the wine, prices remain reasonable for a Northern Rhone of this quality. Still young, tannic and demanding time, the perfume pops with kirsch liqueur, espresso, blackberries, earth, smoke and pepper. Full bodied, fresh, long and rich, when this comes around, I imagine it will be even better and deserving of a higher score. As my 1998's are still young, this is going to need some time. I really like how this is showing now. Good levels of concentration, lush, sweet, ripe, but not over ripe, dark red fruits, licorice, roasted meat, round tannins and length in the finish. The wine improved in the glass. No hard edges to the tannins in this wine, it's really quite supple. Wow! With little encouragement other than splash decanting, the perfume blasts with dark berries, smoke, licorice, oak and black pepper. Full bodied, long, concentrated, big and rich, every mouth coating sip is packed with flavor. This is young, yet it drinks well and will only keep getting better and better. If you're not hung up on modern vs traditional, this is worth checking out. I have to say, I was disappointed in this bottle tonight. The attractive perfume delivered blackberries, earth, coffee bean, dark cherry and mocha notes. On the palate, the wine was missing the fresh acidic pop I get from Cote Rotie. It was not nearly as good as it was a few years ago. This is a wine that needs to be consumed over the next year or two, before it declines further. With a nose filled with sweet, ripe, black and blue fruits, oak, coffee, earth, licorice and spice, the wine is rich, round and supple in style. Yes, it's modern. But I really liked it. It continued to fill out and the oak became less prominent as the wine sat in the glass. This is a nice expression of La Landonne. A super wine that is just starting to deliver on its youthful promise. The silky texture, full body and concentration of ripe, sweet, pure fruits, coupled with complex, earthy aromatics really hits all the right spots. Deep ruby in color, the color has not moved much since the day the wine was delivered. Licorice, garrigue, black raspberry, stone, coffee, blackberry and iron create the potent perfume. On the palate, the big, concentrated wine is intense, rich, fresh and filled with sweet, dark, rich, ripe, juicy, dark berries. After 2 hours in the glass, the texture developed voluptuous, silky sensations along with a sense of minerality. The wine improved in the glass throughout the night. This is just starting to drink well. And the best is yet to come. I was shocked by how young this wine tasted. With 90 minutes of air, the truffle, licorice, cigar box, black cherry, charcoal, earth and herb character began to come out. The wine filled out, softened and delivered silky, lush, concentrated layers of fresh, sweet black cherries and spice. I'd wait another 4-5 years before popping another cork. Still deeply colored, with an attention grabbing perfume filled with pepper, red and black fruits, coffee, black cherry liqueur, bacon fat, spice and earth. Rich, concentrated and powerful, this Cote Rotie is still youthful and tannic. Give it another 2-4 years. I am not sure why the top wines from Delas do not command more attention. Perhaps with its the small production, (250 cases of Landonne), people do not get to taste the wines enough. Oh well... This is better for fans of the wine, as it keeps prices down. Flowers, smoke, ripe, red, fruits and wet earth, with sprinkles of thyme on the nose hit the spot. The wine has filled in, fleshed out and softened over the years, morphing into a really tasty treat, with character and freshness. A late night bottle, popped and poured. This is clearly at peak. Medium/full bodied, soft, silky and no hard edges. The fruit with is fresh, clean and filled with fresh cherries. The aromatics are there, the only drawback was the finish just did not last long enough. There is no reason to hold this any longer. I'll finish my last remaining bottles of the next few years. Licorice, smoke, minerality, boysenberry, flowers, lavendar and cherries pop from the bottle before the wine is poured! Voluptuous, concentrated and open, this fresh, ripe Cote Rotie is developing well. This can be enjoyed now, or over the next 12-20 years. Spice, pepper, Provencal herbs, strawberry, earth and kirsch aromas led the way to soft, polished textures, freshness and a peppery, black raspberry filled finish. This is showing great today. It's in the prime of its life. I'd drink it over the next 7-10 years. 1998 Delas Landonne opens up with bacon fat, cassis, dusty chocolate powder, boysenberry, coffee and violets. The full bodied texture, freshness and sweet, black raspberry flavored, rich, mid palate gives way to a silky garrigue, boysenberry and light coffee flavored finish. This is drinking perfect today. This delivered a splendid perfume of ripe dark cherry and bacon fruit. Great concentration and a long, fruit filled, fresh finish with an array of black and red fruits. With 90 minutes of air, the bottle was really singing with its fresh, mineral driven, cherry, licorice, smoke, stone and caramel nose. Full bodied with a lot of peppery, fresh red cherry filled charm. Still young, this is serving up a nice dose of pleasure. I liked it a lot. Time and air are only going to add more complexity and softness to the wine. Rich, concentrated, fleshy and refined, this voluptuously styled Hermitage wine offers mineral, sweet, ripe black raspberry, cherry liqueur, spice and earth. With a short 20 minute decant, this is already showing well. Still deep in color, with 3 hours of decanting and 2 more in the glass, this was still youthful. Licorice, blackberry, earth, iron, smoke, baked cherries, coffee, pepper and cinnamon scents, this big wine is packed with soft, pure, blackberry, blueberry, black raspberries and round textures. Give it another 2-5 years. I'm looking forward to popping my first bottle of 1999 Delas Bessards and a 1990 Bessards before the end of the year. 1998 Delas Bessards was decanted about 2 hours before consumption. This dark colored wine has a powerful perfume that's filled with smoke, ripe plums, blackberries and spice. Still young, with fleshy textures, concentration and intensity of flavor, this round wine is approachable for a young Hermitage. The polished, black fruit filled finish lasts for close to 40 seconds! This can be enjoyed now, or over the next 12-20 years. Dark ruby with a nose resembling cherries, black fruits and spices blended with iron and minerals. Good concentration and depth of flavor. Well balanced. A lot of weight on the palate with a long finish packed with ripe, juicy fruits. Initially tight when popped and poured, with coaxing, smoke, blackberry and peppery scents could be found. This full bodied wine ends with a red fruit finish coupled with hints of tart cherry, that detracted from the wine. Really nice wine, with its meaty, olive tapenade,, blackberry and earthy profile. Big, bold and concentrated, the wine has depth of flavor and complexity in the nose, leaving you with a big dose of fruit in the finish. As wines age, every bottle is differernt. Some are better and of course, some are worse. We got lucky with this bottle of 1990 Delas Bessards, as it was much fresher and more interesting than the previous bottle from the same case. The debut vintage of Delas Bessards offers smoke, earth, minerality, black cherry, spice, truffle, tobacco and tar. Soft, elegant in a masculine sense, ripe, spicy cherries and strawberry complete the finish. This is fully mature. There is probably not much to gainied by holding it any longer. A complex nose of licorice, bacon fat, spice, cherry, garrigue, smoke and ripe, black raspberry and barbeque filled the perfume. Medium/full bodied, soft and supple, this fully mature Hermitage wine finished with fresh, spicy dark berries.